Living at the foot of the Rocky Mountains in Colorado, as I do, I am blissfully aware of their beauty and majesty. Yes, sometimes they are purple. This superbly illustrated "Cube Book" is a delight from start to finish. The very first photograph was taken in Colorado, but this book covers mountains around the world. Included are Mount Everest, El Capitan, Mont Blanc, French Alps, the Matterhorn, the Dolomites, Kilimanjaro, the Himalayas, and many more. Exquisite vistas that have beckoned travellers, climbers, and hikers alike, fill these pages. Whether it's a mountain of granite or ice, or a volcano, each has its own beauty and attraction. 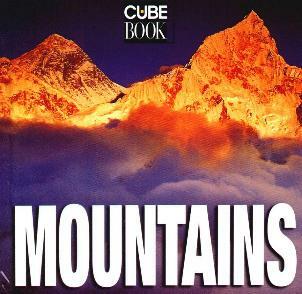 Awe-inspiring too, are the glaciers featured in this book. High altitude dwelling people and animals are also featured, making this a well-rounded and extremely interesting book which speaks volumes. Text here and there gives a little information but it's all about the pictures. Thank you to the brave and adventurous photographers. See my reviews on The World and America, also from White Star Publishers. Conclusion - The perfect gift for anyone enthralled by Nature.